I’ve always been fascinated by the huge underground industry of scam artists in the internet. These criminals bilk millions of dollars away from their unsuspecting victims every year. It’s interesting to see the cat-and-mouse chase between the artists and the authorities. By the looks of it, the scam artists are always two steps ahead of their pursuers. With that said, the authorities really can’t do anything significant to protect you from there online criminals. Only you can truly protect yourself. Needless to say, you need to be aware of the tactics that these criminals use. I just finished reading Jeffrey Robinson’s amazing book called There’s a Sucker Born Every Minute. It’s a book packed with information about the online scam industry. It teaches you how to spot frauds and how to stop them. My favourite part of the book is the last chapter where Robinson provides thirty-nine very practical tips on how to protect yourself from fraud. Anyone who spends time on the internet should read these tips. My favourite tips from the list are listed below. I highly recommend that you purchase the book and read it in its entirety. 1) Keep in mind that fraud is a two-way street crime, which means that before a con man can do any harm, you have to open the door. To get you to let him in, a fraudster will employ every trick he can think of and all the chicanery he can muster. Therefore, never allow yourself to be rushed into a decision. Always take the time to step away, to get some perspective, and to think about what’s happening. Just a few extra minutes can be enough to protect you from a great deal of harm. 2) Keep an eye for anomalies. Look for variations from predictable behaviour. Look for things that seem out of place. Listen for things that don’t sound right. If you see it or hear it, ask yourself, why? 3) Do not pay money to receive money. Wiring a stranger a fee on the premise of receiving a big prize, to obtain a service, to reduce or consolidate debt, or to remedy a bad credit rating is utter foolishness. The most common scams right now involve asking consumers to wire money in order to get a larger amount in return. It won’t work. 4) If you are going to provide someone with your card number, either by phone or online, be absolutely certain that they are reliable. Consider the fact that anyone obtaining your credit card number, the card expiration date, and three-digit ID that appears on the back can then use that card to buy something online or over the phone. Card not present fraud is rampant. So be very careful to whom you hand that key to your credit card. 5) Never open an attachment or download anything that comes in an email from someone you don’t know, or don’t totally trust. Violating this rule is the surest way to become a victim of identity theft. 6) Never forget that what you do online stays online. And here’s the table of contents for the book. It should give you a pretty good idea as to what to expect from its pages. 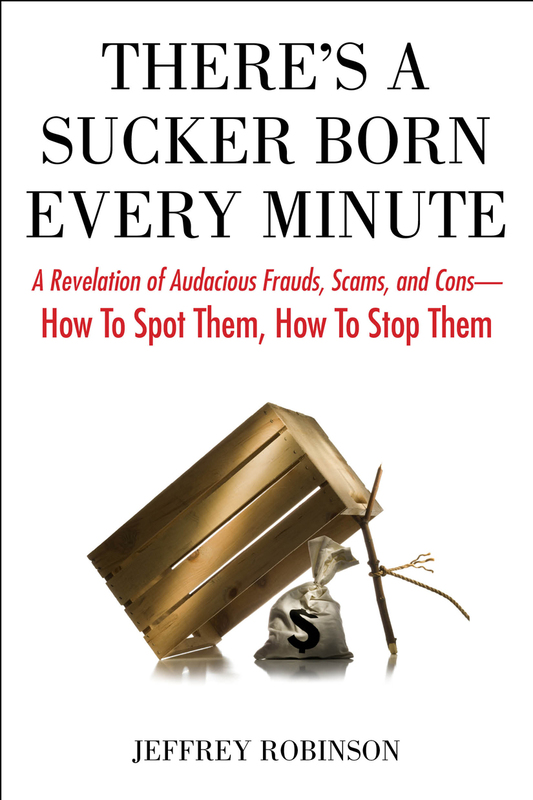 “In this jaw-dropping expose of fraud in America today – who’s doing it, how it’s done, and how you can protect yourself – the world of fraud is laid bare: from personal finance and investment schemes to Internet scams and identity theft, to pyramid cons and the infamous Nigerian advance fee frauds. Jeffrey Robinson gets inside the heads of the most notorious scam artists to uncover the psychological weapons they use to entice victims. With uncanny clarity and insight, he shows how to spot a scam and how to limit your exposure to fraudsters.